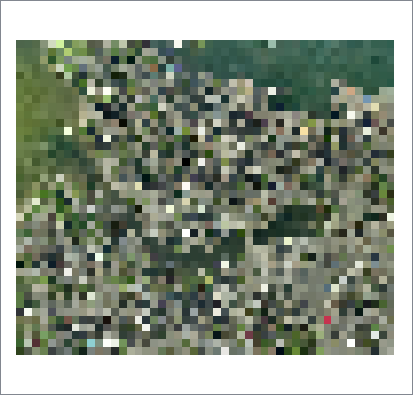 Creates series of raster tiles for use in web mapping applications such as Bing™ Maps, Google Maps™, or Web Map Tile Service. Tiles are produced at varying zoom levels, size, and resolution. The WebMapTiler accepts raster features, and "pyramids" them - resampling and tiling them as necessary to produce a set of raster tiles appropriate for different zoom levels as required by various web mapping tile schemes. The minimum and maximum zoom level may be specified, or left unset to produce the minimum and maximum level supported by the resolution and size of the input raster(s). Tile size may be specified for some Tile Schemes. Various methods are available for interpolation of pixel values during resampling. 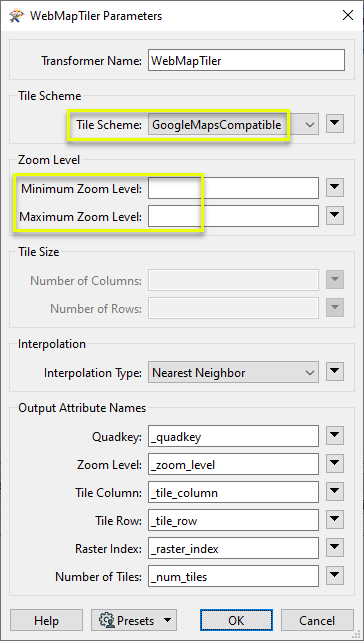 Attributes may be added to the output tiles to record zoom level, tile position, original raster index, number of tiles produced, and Quadkey (used for quad-tree based tile schemes). This transformer is unaffected by raster band and/or palette selection. At level 0, the entire world is represented by a 256x256 pixel tile. Each level increases the number of rows and columns by a factor of two: level 1 is 512x512, level 2 is 1024x1024, and so on. The number of tiles is increased accordingly - 1 tile, 4 tiles, 16 tiles, and so on. 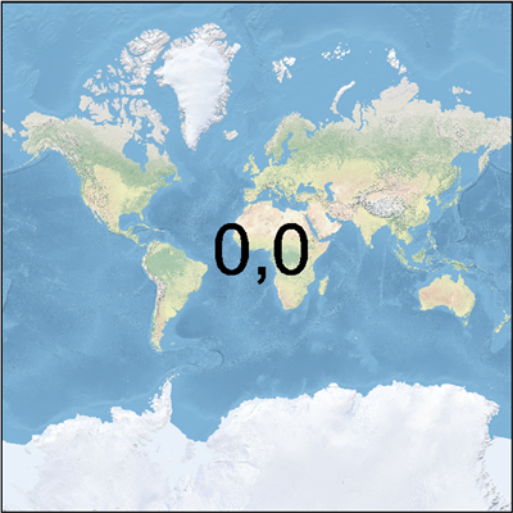 At level 0, the entire world is represented by a 256x256 pixel tile (where the first and last 64 rows of the tile are blank). Each level increases the number of rows and columns by a factor of two: level 1 is 512x512, level 2 is 1024x1024, and so on. Spacing is defined in degrees for each level. *Incoming rasters that are not in the required projection will be reprojected by the transformer before tiling is carried out. 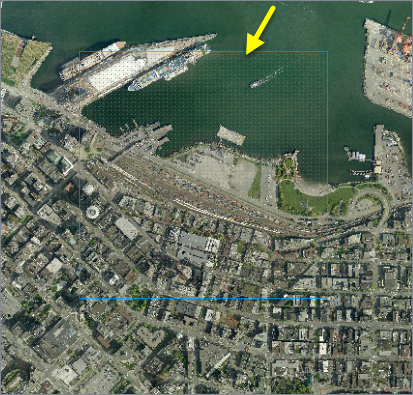 In this example, we prepare a single 4800 x 4000 orthophoto of Vancouver (at 1 meter resolution) for use in Google Maps. The source image is a single GeoTIFF. Note that the projection is UTM83-10 - the transformer will need to reproject it before resampling and tiling. The raster is routed into a WebMapTiler. In the parameters dialog, we choose GoogleMapsCompatible as our Tile Scheme. Note that the Zoom Levels have been left blank. The transformer will calculate the appropriate minimum and maximum levels that can be produced from the input raster. The zoom levels, as well as the size and position of the tiles for each level, are fixed by Google Maps. The WebMapTiler will adjust the output rasters to fit into these standards. A total of 740 tiles are produced from the original. The number of tiles per zoom level can be analyzed with a StatisticsCalculator. Note that only zoom levels 5 through 17 have been produced (out of all possible levels, from 0 - the entire earth - to 23 - the smallest possible area of coverage given the original image size and resolution). 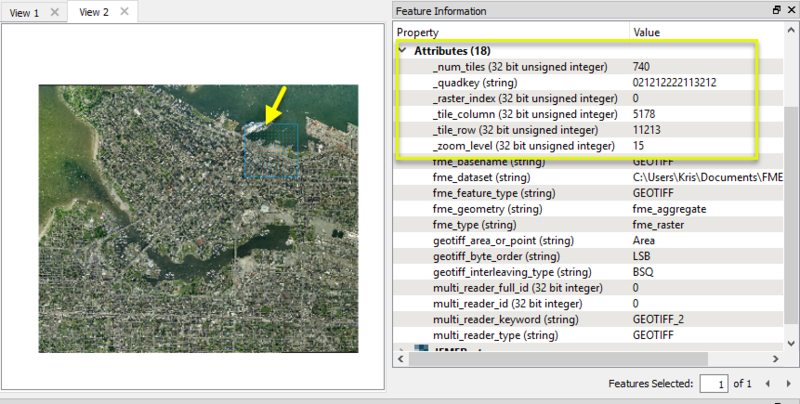 Examining the single tile output for zoom level 10, note the new attributes added including tile position, zoom level, quadkey (used by Google Maps), and more. The extent of the original raster falls wholly inside the extent of this standard tile’s size and position, so the raster has been padded with blank cells. A close view of the portion of the raster containing the original shows the resampling to an appropriate (lower) resolution. 42 tiles were produced for zoom level 15. A closer look at the selected tile clearly shows that higher resolution is retained for higher zoom levels. To resample rasters using zoom levels and positions that are not tied to one of these web mapping tile schemes, consider using the RasterPyramider. Attributes can be used for output file naming - for example the output feature type name can be set to the Quadkey attribute value. Generally, when writing out the rasters generated by this transformer, one would set the destination feature type name to be the quadkey value for Bing Maps or a combination of the zoom level, tile column, and tile row for Google Maps. The PNGRASTER writer is recommended for the best results. For best performance, rasters output by this transformer should be written in the order they are output. Changing the order (for example, by using Dataset Fanout or a Sorter transformer) may negatively impact performance. Alternatively, use a RasterCheckpointer after the WebMapTiler, but prior to the operation that changes the order. When a tile contains areas outside the original raster coverage, an alpha band may be added to the tile to identify these areas. If this band is not desired, it may be removed with the RasterInterpretationCoercer transformer. This transformer accepts only raster features. Tiles with additional attributes, produced according to the selected Tile Scheme and other parameters. See Tile Schemes above for more detail. 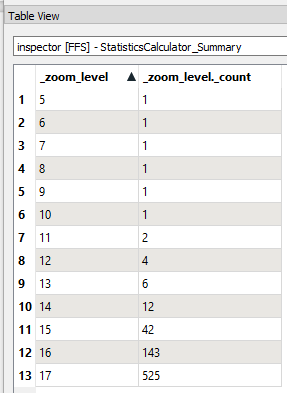 These parameters specify the zoom levels for which tiles will be generated. Valid values vary by Tile Scheme - see Tile Schemes above for more detail. If these values are left blank, the transformer will calculate an appropriate range of zoom levels based on the input raster. (Optional) Specify the minimum zoom level to be generated. If Minimum Zoom Level is unspecified, the minimum zoom level will default to the minimum level at which the raster is visible. Note that tiles will not be generated if the input raster covers less than 1 row and 1 column at a particular zoom level, regardless of the minimum zoom level value. (Optional) Specify the maximum zoom level to be generated. If Maximum Zoom Level is unspecified, the maximum zoom level will be the smallest zoom level such that the resampled raster has more rows or columns than the original raster. These parameters specify the size of each output tile for tile schemes that support user-defined sizes. Number of Columns Specify the desired tile width in cells (pixels). Number of Rows Specify the desired tile height in cells (pixels). Nearest Neighbor The simplest and fastest method. Values are copied from the nearest cell. Bilinear Calculates a weighted average, adjusted for distance, from the four (4) nearest cells. Bicubic Calculates a weighted average, adjusted for distance, from the sixteen (16) nearest cells. Calculates a simple average from the four (4) nearest cells. Similar to Bilinear and is useful for numeric rasters such as DEMs. Calculates a simple average from the sixteen (16) nearest cells. Similar to Bicubic and is useful for numeric rasters such as DEMs. If attribute names are specified, new attributes are added to the output tiled rasters. If specified, an attribute will be added to each output feature specifying the quadkey for that tile. Quadkeys are used by Bing Maps to uniquely identify a single tile at a particular level of detail. Note that this attribute will only be created for quad-tree based tile schemes (GoogleMapsCompatible and GoogleCRS84Quad). Zoom Level Attribute If specified, an attribute will be added to each output feature specifying the zoom level of that tile. Tile Column Attribute If specified, an attribute will be added to each output feature specifying the column of that tile. Tile Row Attribute If specified, an attribute will be added to each output feature specifying the row of that tile. 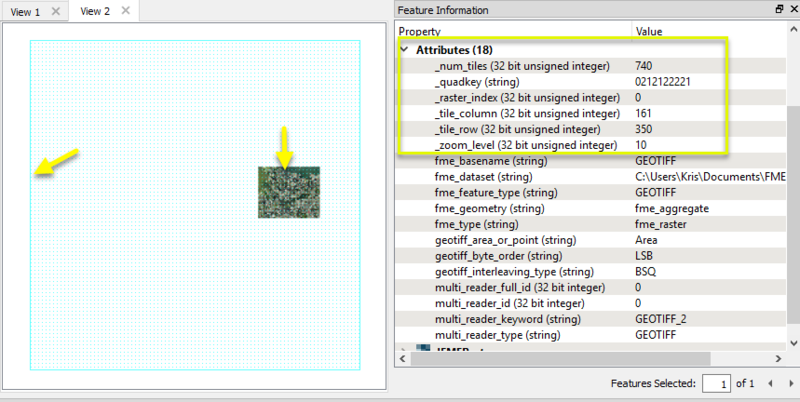 If specified, an attribute will be added to each output feature that identifies which raster it was created from. This index is zero-based, so all tiles created from the first input raster will have a value of 0, all tiles created from the second input raster will have a value of 1, etc. Number of Tiles Attribute If specified, an attribute will be added to each output feature identifying the total number of tiles created from the input raster, across all zoom levels. History This transformer was previously named the VirtualEarthTiler. Search for all results about the WebMapTiler on the FME Community.